If you've ever wished you could snap a bigger screen on your smartphone or stand it up to use it as a tiny laptop, this crazy little gadget might pique your interest. Just don't expect to buy one any time soon. PaperFold is an experimental device developed by the Human Media Lab at Queen's University in Kingston, Ontario. 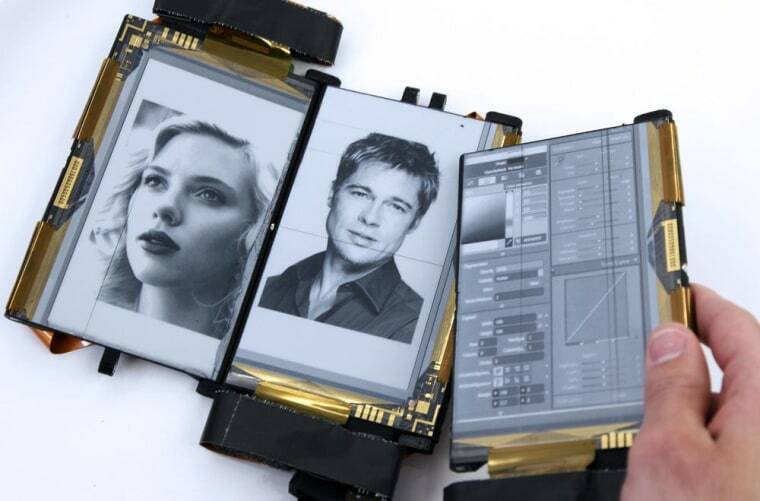 It's made up of three separate e-paper devices, which the developers call "tiles," each about the size of a large smartphone. Just need a phone? Use one tile the way you'd use a normal handheld device. Want a touchscreen keyboard and a separate screen? Snap the second tile on. Want a big folding map or three-sided standing display? Get that third tile attached and bend them however you like. The inspiration for the device is, of course, paper. "Books use folding as both a navigational and space-saving technique, and paper maps have malleable display sizes," explained Roel Vertegaal, a professor at the lab. "PaperFold demonstrates how form could equal function in malleable mobile devices." It's very much just an experiment at present, but snapping new pieces onto your smartphone may not be so far off. Google is working on a modular phone that could provide some (but not nearly all) of this functionality; look for it early next year.